The Shutter Card Tutorial will simplify everything for you in easy to follow steps ... because this card looks much harder than it really is. And once you get the hang of it it is sure to please both you and the recipient. If you are new to this kind of Kinetic Card fold then it is better to have a few practise runs on some cheap card or paper first. Then once you feel confident enough you can cut into that beautiful piece of card you have been saving and stroking for quite some time. Know what I mean ??? I always advise that you make your own Templates and to keep them safe. Then if it is some time before you make the card again, and you can't remember the steps you took ... this will be something that you can always refer back to. This is a very short video, only five minutes, but it will take you step by step through making the template. I have also added the written instructions for you so if you prefer to read them then you will find them Here. This card can look very pretty when made from glitter or mirror card or any other Specialsied Card that you may have in your "Stash"
And although it looks daunting at first I hope you won't let that put you off. Give it your best shot ... take your time and have a practise run first. And remember that the more you make of any of these new ideas the better you will get with all your cardmaking projects. 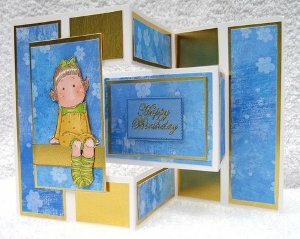 You can dress the finished project up in any way to suit any occasion and I hope you enjoy making this card. And then make your way through some of the other sections ... all there to help you be the best cardmaker you can be.